Join the conversation on Twitter with #womenHIVNCDs. Join the conversation on Twitter with hashtag #womenHIVNCDs. 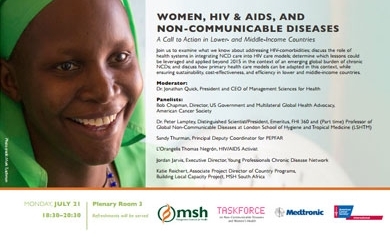 Follow @MSHHealthImpact, @AmericanCancer, @PEPFAR, @NCDAction, @HIVShareSpace, @FHI360, @Medtronic. This entry was posted in Events, Live updates, Photos and Videos and tagged #womenHIVNCDs, advocacy, American Cancer Society, Bob Chapman, FHI360, Jordan Jarvis, living with HIV, NCDs, PEPFAR, video, women, Young Professionals Chronic Disease Network by Rachel Hassinger. Bookmark the permalink.